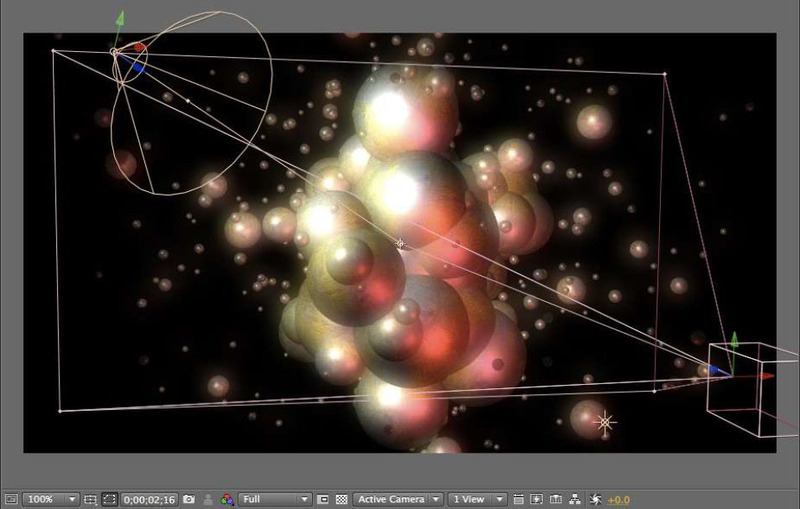 BCC Particle Array 3D is a particle based generator style filter. 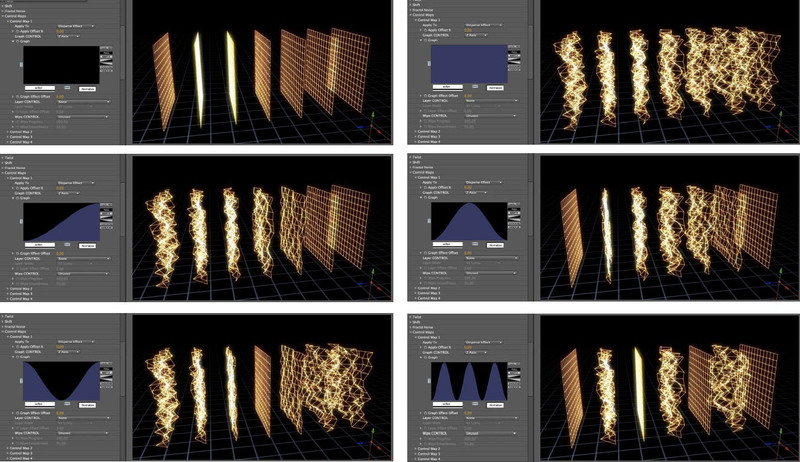 Particle Array 3D generates a 3D array of particles and offers several interesting ways of manipulating the array based on graph controls, alternate AE layers, fractal noise patterns, random dispersion, and more. The filter supports AE lights and camera for simple integration into AE 3D compositions. It also includes an integrated Beat Reactor group for creating dynamic animations directly influenced by audio layers. Use Source Mask: When enabled, the particle array will take any masking applied to the filter layer into account in it’s use of the layer, otherwise it will ignore masks. Motion Blur and Shutter Angle ; offers options for various levels , simulating motion blur seen in camera footage. When set to Host Settings, the motion blur of the filter matches the motion blur set for the AE comp it’s applied in. Depth of Field Blur: Determines the amount the amount of blur in front and behind the focus of the camera. Particle Shape ; determines the type of particle used in the array. 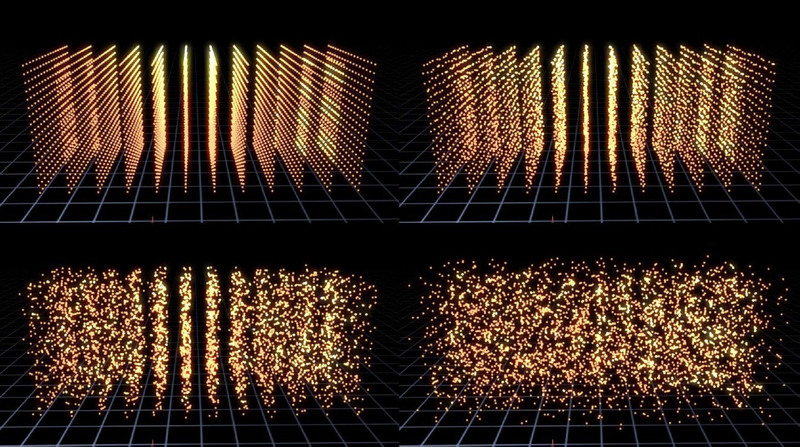 3D Particle Types support 3D lighting and textures, while most other choices do not. The Custom Shapes choice also supports 3D lighting and textures. Preserve Orientation ; when Preserve Orientation is enabled, 3D particles’ orientation in relation to the camera is maintained regardless of the camera perspective or array rotations. This means that if the Particle Transforms are left at default, the particles will always seem to be facing the camera which is useful for some types of effects. The Preserve Orientation setting does not apply to other (non-3D) Particle Types since those types always face the camera regardless of perspective or rotations. Size, Size Variance, Min Size ; for adjusting and varying the size of the particles. Opacity ; determines the translucence of the particles. Shape Character ; this parameter makes the 3D Discs to appear with hollow centers and it can change the 3D Cylinders into Cone shapes. Material Shininess and Material Specular ; for 3D snd Custom Shape particle types, these parameters allow for adjusting the appearance of 3D lighting on the surface of the particles. Array Layout (Grid, Grid Sphere, Onion Spheres, Random Box, Random Sphere) ; options for the shape of the array. Num Particles X, Y, and Z ; sets the number of particles along each axis. Master Scale, Scale X, Y, and Z ; sets the overall scale of the array without changing the size of the particles. Graph Controls: in the illustrations below, the Control Map is set to Apply To Disperse Effect, and the Graph Control is being used to map the dispersion to the array. The 1st image (upper left) shows an empty graph (no dispersion) and the 2nd image (upper right) shows a full graph (dispersion over the entire array), the other images show partial dispersions based on the graph. The array is being viewed from a camera pointed at it from the right side ; for the 1st 6 images the graph is being applied along the Z Axis, and for the last 2 images the graph is being applied along the Y Axis. Graph Control Graph UI: The blue colored area of the graph represents areas of the particle array that will be affected by the control map effect while black represents areas that will not. How the graph maps to the particle array in 3D is determined by the Graph Control popup menu that offers choices such as X, Y, or Z Axis, etc. Graph Buttons: The graph includes buttons for flipping the graph horizontally and vertically, buttons for making the graph FULL (completely blue color) or EMPTY (completely black color) or half and half using even diagonals. The RANDOM button will generate a random graph and it can be useful to try clicking this button repeatedly watching the graph and the effect on the particle array to spot interesting results. 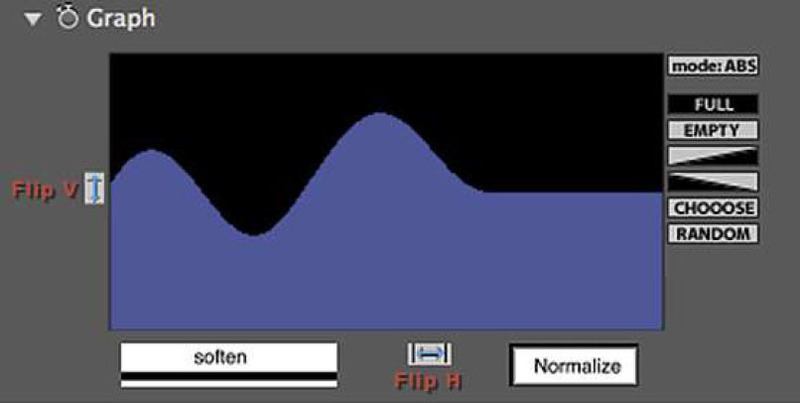 The CHOOSE button cycles through a series of preset graphs illustrated immediately below. These preset graphs can be used as they are or modified in various ways. By keyframing the graph itself it’s also possible to interpolate between them. Note: The graph itself is an animatable parameter, and so it is possible to have different graphs on different keyframes and the filter will interpolate between the 2 graphs. This can be used to get some interesting results. Wipe Control ; offers many options for wiping the effects of the control map on and off. Below are images showing a particle array with the Color Mix Color partially wiped on using various wipe types. Wipe Progress and Wipe Smoothness ; @ Progress zero none of the control map effect is displayed, @ Progress 100 the control map effect is entirely wiped on. For some effects, extending the Progress to 200 allows for further wiping the effect to the other extreme (so the entire array is displaying the effect). Wipe Smoothness allows for a softer edge to the wipe.